Comments The packaging of this model shows an incorrect fleet name of Lothian Regional Transport, a title that changed in 2000. 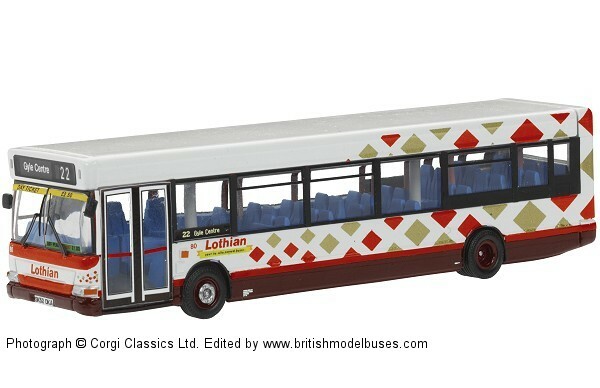 Fleet number 80 (SK52 OKA) was part of a 2002 delivery of 35 Dennis Darts to Lothian Buses wearing a simplified version of the lowfloor “Harlequin” livery. In keeping with previous practice, these buses were primarily purchased to cascade older Darts from Longstone Garage on busy high frequency 24 hour services 22/N22. Whilst the majority of the buses were given route branding for either the 22/N22 services or the Night Bus Network, 80 was one of 10 unbranded vehicles which could also be used on other lowfloor single deck routes from Longstone such as the 18 (later renumbered 20) and 38. 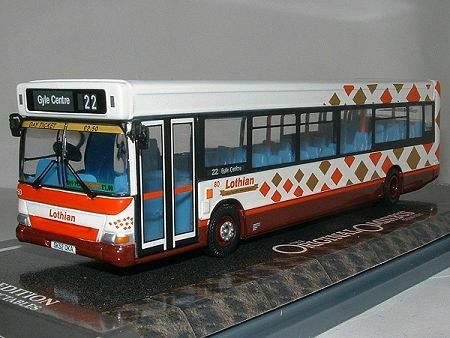 During 2003, Longstone lost operation of the 22/N22 to Central Garage with 20 route branded Darts transferring to that depot. 80 was one of the batch remaining at Longstone and, in addition to the 20 and 38 services, can be found on routes 24 and 30/N30 which are now the responsibility of that depot which also acquired 15 new SPDs in 2003. I am very grateful to Richard Walter for providing the above information.